Ask yourself: what is the favorite party favor you've ever received? 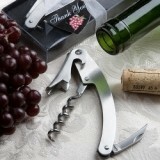 We'd be willing to bet it was some type of wine-related barware and most likely a wine bottle opener or bottle stopper! And there are so many beautiful and whimsical ones to choose from. For example, if you're planning a French-themed romantic wedding, you'll find stoppers topped with a replica of the Eiffel Tower. Planning a beach wedding? You're in luck because you'll find wine bottle stoppers topped with starfish, stylized scallop shells and even a clear globe filled with smooth sand and small sea-shells. 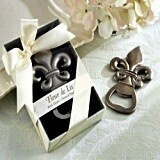 In fact, there are stoppers for just about any wedding theme: hearts aplenty, fleur-de-lis, calla lily, spring butterfly, fall leaves … the list goes on and on. 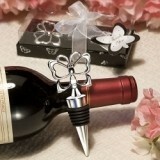 As for bottle openers, you'll find lots of designs complementary to the stoppers. Popular new designs include several key-shaped openers.